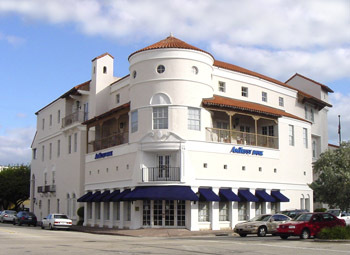 Currently the Coral Gables branch of Amtrust Bank, this building was the banking Headquarters for the former Bank of Coral Gables. At the Owner's request, the building and its interiors were designed in the "Old Coral Gables" Mediterranean style, duplicating the much smaller, but historically renowned Lauck's Showroom, formerly housed on the site. The building provides 24,300 sf of banking and office space on three floors, including a mezzanine level. An adjacent lot has drive-through and walk-up teller facilities, also in the same architectural style. The facility was awarded the City of Coral Gables “Keeper of the City Beautiful Award” for design and construction.